A research aimed at evaluating the reproductive performance of pigs as influenced by breed, season, and parity was carried out. Reproductive performance records of 1383 sows made up of 204 primiparous and 1179 multiparous large white (687) and Duroc × large white crosses (696) obtained over a 3-year period (2013 to 2016) were used. Data on reproductive performance taken were farrowing rate, litter size at birth and at weaning, piglet weight at birth and at weaning farrowing interval and pre-weaning mortality. To determine the effect of season, parity and breed on reproductive performance, the 4-way analysis of variance (ANOVA) was used. A mixed model was fitted using the generalized linear model (GLM) procedure of the GenStat (Discovery Edition) to investigate the fixed effects of breed (two classes), season of birth (three classes) and parity (five classes) on the reproductive traits. Where differences in means were observed, the means were separated using the least significant difference at 5% level of significance. Results obtained indicated litter size at birth of 12.5 ± 0.3 and 14.2 ± 0.5 for the large white and the Duroc × large white respectively and farrowing rates of 90.0 ± 2.3 and 94.5 ± 2.5% for the large white and the Duroc × large white respectively. Litter size at birth and at weaning, farrowing rate and piglet weight at birth were all influenced by parity and season with increasing parity significantly reducing litter size at birth and at weaning. Reproductive traits of the sows were superior during the rainy season, an indication of the need to consider season of birth in making decision. 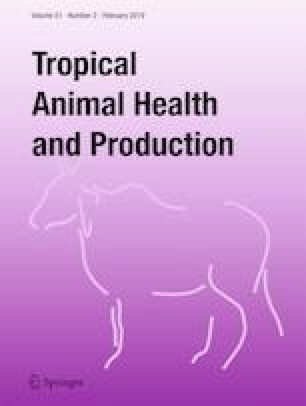 The authors would like to acknowledge the immeasurable cooperation of the management and staff of Teaching and Research Farm of the University of Cape Coast, Ghana, for the data made available for the research. The authors are also grateful to the Department of Animal Science, University of Cape Coast for the financial and technical support.